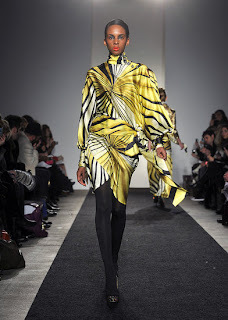 For Fall 2010, Binetti delivers dramatic pieces with long, flowing silhouettes in some bright prints including Eclipse and Red Saigon. 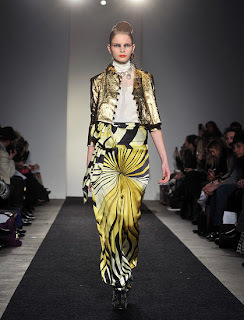 The palette also includes a mixture of white, cream, red, yellow, gold and black. 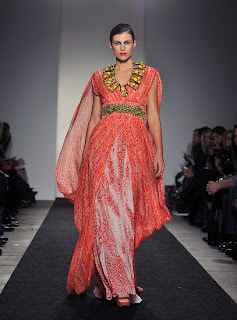 Diego Binetti draws inspiration from his exotic travels to the Far East, incorporating culture and ancient landmarks, creating opulent and sensual gowns and separates. 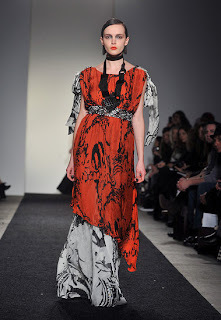 The first look down the runway is one of my favorites - a printed red and white empress gown. The majority of the fabrics come in silk chiffon and satin charmeuse. I can always count on Binetti for rich embellishments, this time with Swarovski crystal ball buttons, jeweled necklines and beaded detail. Accessories include multi colored incrusted beaded bands, double braided belts, mirror belts and two-tone or double sided satin sashes. Let's not forget the open-toe Giuseppe Zanotti shoes that appear as a pump as well as an ankle bootie. 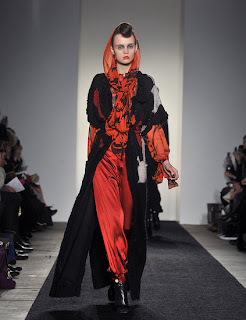 This collection has a lot of separates that can be mixed into everyday wear - sheer chiffon blousons, silk charmeuse bo bo pants, straight leg skirts, cashmere cardigans, long cardigans and one of my favorites, the golden micro fabric semi-swing jacket. Some of the stuff that these items of clothing can be matched with is amazing, from jeans to shorts and skirts to bikinis (honest !! ).